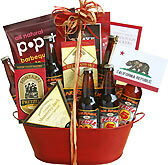 An ideal gift for the beer lover at heart! 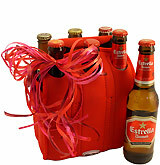 Our Valentines Day gifts are designed in price ranges to suit your budget and loving beer fans. 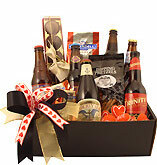 Featuring a gift combination that is thoughtful and enjoyable to add sparks for the loving season. 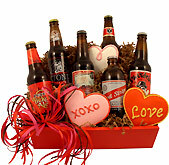 Our Valentine's Day beer gift baskets are brimming with beers from micro brews to international styles and are put together with food snacks ideally suited for the occasion of romance and fun. 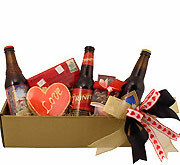 Send our Valentine's Day beer gifts to loved ones with fun-filled combinations including Valentine sugar cookies, nuts, pretzels, chocolates and more.. 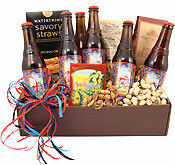 The season of loving gifts are available to ship to many states throughout the country. 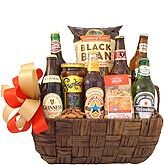 The price of each gift basket excludes shipping charges. 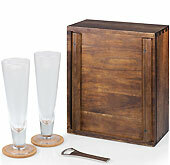 The cost for shipping is based on the gift selection's size and weight. See our site under shipping details for more information. The Odell Brewing Company is a true Cinderella story that sparked from one man's brewing hobby. This man was Doug Odell, and his passion turned into a business after his honeymoon in the UK. The small breweries offering quality pale ale inspired him and his new wife to return to the states and start their own little brewery. That was in 1989, and the brewery is now going strong with popular pale ales like 5 Barrel Pale Ale. They use five varieties of hops while brewing this complex beer, but the stars are the Willamette and Crystal hops. Combine that with Munich and Pale malts, and you have the recipe for a winning pale ale that has served Odell's small brewery well. The citrus influence on this beer recipe is apparent in the aroma. Once you pour the deep orange beer, that fruity scent will hit your nose just as a bright white head bubbles to the top of your glass. While the hops aren't prominent enough to meet the standards of a true hop enthusiast, this is a pleasant brew that you can casually sip while chatting with friends, while unwinding from a long day, or while watching your favorite sports team battle for a win. The Indian Wells Brewing Company decided that minimalism was good when they created their dark brown beer known as Lobotomy Bock. 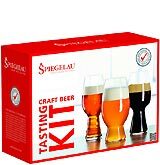 Perhaps you wouldn't trust the Brewers with a scalpel while standing over your brain, but you might want to trust them with the lobotomy that comes in a glass with no cutting blade required. This lobotomy pours into your glass a deep brown, mimicking a soda but adding an intense aroma with a fruity kick. The carbonation is kept to a minimum. The foam is minimized as well. 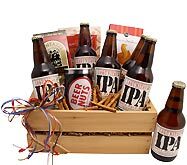 What you get is a classic German Bock brewed with nothing more than quality hops, premium malts, yeast and pure artisan spring water drawn from the Indian Wells spring that gave this brewery their name. Lobotomy Bock combines Munich malts with malted barley and three additional malts. Then they added Sterling and Perle hops. The hops are dropped into the brew at the boiling stage of the brewing process, and they reappear at the end to create a finishing touch of bitterness. Living up to the brewing company's authentic German roots, this beer combines only the essential ingredients. They also spend a few weeks on the lager process, so get ready for a purely German experience. 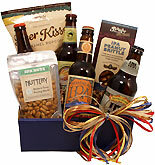 The Rogue Brewing Company knew that they had a winner on their hands when they released their popular Chocolate Stout. 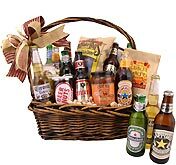 Rather than resting on their successes and moving on to other flavors, they stoked the recipe to create an even more intense drinking experience for their chocolate-loving fans. They created their Double Chocolate Stout to great applause, and it has earned the brewery three gold medals from the World Beer Championships. 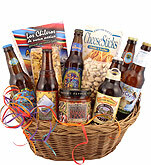 While the star ingredient in Double Chocolate Stout is the Dutch bittersweet chocolate, the flavor profile also depends heavily on honey, roasted barley and rolled oats. This is a malt-heavy beer that storms the palate with the flavor of bittersweet chocolate at the top of every sip. The bitterness is nicely balanced by a combination of C120, Two-Row, Risk™ and Rogue Farms Dare™ malts. Rogue Farms Rebel™ is the lone hop in the recipe, and it adds just the right touch of bitterness to tame the sweetness of those malts. The brew delivers a stiff hit of alcohol at nearly 9% ABV and holds true to the Rogue Brewing commitment to purity. You won't find preservatives, additives or chemicals in this chocolate-inspired beer. The ingredients are always limited to those needed to create an award-winning flavor and aroma. When life starts to feel too heavy, it's time to pull out your little red wagon and wheel your way to Fire Island, New York. This is home to the Fire Island Beer Company, and they drew inspiration from the local culture when creating their Red Wagon IPA. Visitors to the island often use red wagons to pull their belongings, reflecting the low-key attitude of people who come to the island in search of relaxation and fun. 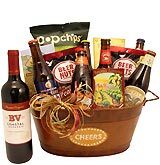 If you have a mug and a little time to kick back with a bottle of Red Wagon, you don't need to visit the island to relax. The excitement can come to you whenever there's a reason to celebrate, or you simply need a moment of peace. Red Wagon is an India Pale Ale that embraces the bitter qualities of Crystal, Warrior, and Cascade hops. Caramel, Two-Row, and Munich malts work hard to balance the intensely floral flavors of those hop cones. Together, the recipe presents a bold sweetness with a hint of fruit and the crispness of a toasted cracker. It also offers an earthy quality that prevents the malts from getting too sweet, so every sip ends with a bitter hit of hops. The Great Divide Brewing Company produces their Velvet Yeti Nitro Stout in small batches and limits distribution to their taproom in Denver, Colorado, so your options are a keg or an in-person experience. It's poured from the tap using nitrogen, delivering extra smooth consistency and a satisfying level of festive bubbles. Released in 2016 and containing only 5.0% ABV, this is the lightest addition to the Yeti brew line. The lower alcohol content and velvety smooth consistency allow you to enjoy more than one glass when it's time to celebrate. Velvet Yeti makes its first impression as a dark beer with a rich chocolate color and a tall head of off-white foam. The proud aroma is roasted and warm with a hint of caramelized sweetness. Once you take a sip, the dominant coffee flavor will hit your taste buds with a simple roasted quality. There are hints of caramel and toffee, but chocolate-infused coffee is the lasting impression. 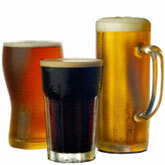 While Velvet is a big departure from the bold flavors and high alcohol content of the preceding Yeti beers, it introduces an alternative for drinkers who want to kick back with a smooth, light brew that goes down easy glass after glass. The Stone Brewing Company released their Stone Ruination Double IPA in April 2015. They later updated the name to Stone Ruination 2.0 in an attempt to highlight the intensity that the brewers put into the recipe. They combined some of the most powerful hops available today to create a brew that isn't afraid to let the bitterness shine. This includes Azacca, Centennial, Citra, Magnum, Nugget and Simcoe hops. 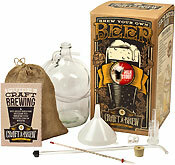 The advanced brewing practices of hop bursting and dry hopping are used to maximize the goodness drained from every hop cone, intensifying the aroma and flavor of every glass. 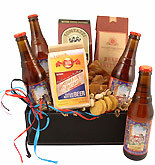 They also delivered the alcohol with 8.5% ABV, creating an India Pale Ale that you're destined to feel upon consumption. Stone Ruination 2.0 tastes great straight from the bottle, but this is one beer guaranteed to put on a show when poured into a glass. It pours with a cascade of bubbles, all traveling toward the top of the glass along with the tall head of creamy, off-white foam. The foam maintains its integrity throughout the drinking session and offers clumps of lace that stick nicely to the edge of the glass. This is almost as enjoyable as the complex flavor that blends grapefruit, orange, peach and other fruity highlights with the piney essence of quality hops. Serving a variety of beers in a festive environment from three tap rooms in Albuquerque, the Marble Brewery is where you turn for good times. When your celebration doesn't involve a visit to New Mexico, you can always pick up a few bottles of their Red Ale to celebrate on your own terms. This is an American-style red ale that pours into your glass a deep amber with just enough white foam and side lacing to set you up for an enjoyable experience. While the brew doesn't offer much of an aroma, it makes up for that with an intense hoppy bite. This bitterness comes from the combination of Citra, Crystal, Cascade and Centennial dry hops. The Brewers also chose Chinook, Cascade, Mosaic and Crystal hops to fill the kettle, delivering bitterness that tingles on your tongue with a sour quality. To balance out those hops, the brewers added Vienna, Two-Row, C-120 and C-75 malts. The malty sweetness serves as a foundation for the beer, bringing the sour bite under control without stripping the hops of their power. The result is a popular brew that keeps drinkers pouring into the Marble tap rooms or picking up bottles from their local stores. With 6.5 percent ABV, this blend of toasted malts and Pacific-Northwest hops packs enough punch to make you feel divine.